AMLBitcointalk is hosting AML BitCoin’s CEO, Founder, and Creator, Marcus Andrade, for an AMA (‘Ask Me Anything’), to answer any non-technical support questions about AML BitCoin. 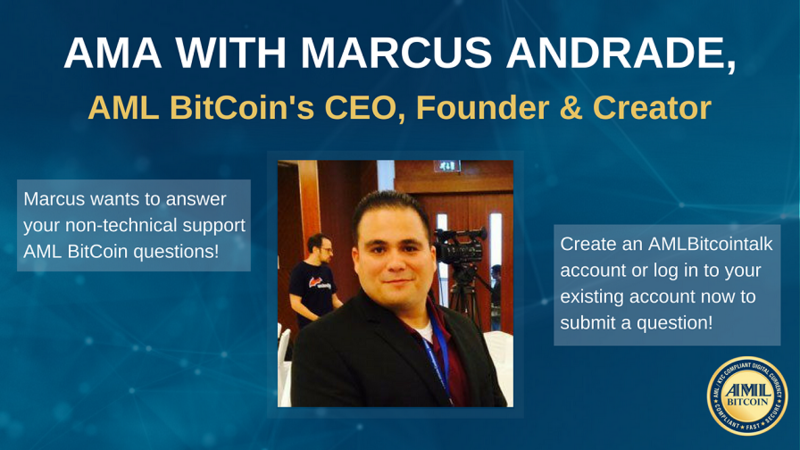 To submit questions to Marcus, please register for an AMLBitcointalk account or sign into your existing AMLBitcointalk account. Once signed in, please click on the ‘My Messages’ tab in the navigation and then click on ‘Send a Message’. In the ‘To’ field, please enter MarcusAndrade. In the subject line, please put AMA, and then enter and submit your questions. Marcus will publish answers to your questions in this thread asap! The AMA commences on May 2nd! Token holders with technical support questions should visit the technical support discussion on AMLBitcointalk, located here: https://amlbitcointalk.org/index.php?board=7.0. What activities are you working on currently? Thanks so much for asking. We are currently working very hard to finalize the listing of the AML Token on a number of digital currency exchanges. Because the exchanges have been trying to remain current with various governmental regulations, and because we have had to spend a whole lot of time proving we are not a securitized token, it has been a very long process. Each exchange has their own legal department and we can’t force them to hurry up because the exchanges already have a whole lot of work already piled up on them. Then, since we are not an ERC20 token, the code audit process does take time for the exchanges. We are currently on the IDAX exchange. We anticipate a few more exchange listings within the next 30 days. The rest of our focus lately has been to meet with governmental and industry leaders to work out usage of the AML BitCoin in their payment systems. I have been traveling extensively over the past few months to personally educate governments on almost every continent as to the benefits of AML BitCoin, and the enthusiasm is strong. Of course, governments move at a glacial speed, so things will take time, but I have never been more confident in the future of our project. I have also been working very hard to make sure everyone in the world has access to a digital identity. Remember digital identities are needed to meet the I.D. verification standards before one can convert from an AML Token to the AML BitCoin. This is also one of the main reasons for my international travel. What are your goals for the project in the next 3-6 months? Our goals include commencing trading on as many exchanges as possible, and concluding partnerships with governments, banks and major industries to integrate the AML BitCoin and/or digital identities into their operations. Since we are the only digital currency with patented AML/KYC features, we believe we will have a number of exciting announcements in the next few months so stay tuned! How do you respond to those that say this is not a legitimate project? We know that, like any online community, the digital currency world has a number of opinionated participants, including some who fear the introduction of a digital currency that is compliant with AML/KYC demands of governments around the world, so some of the folks questioning the project might not share our vision of the future. That’s fine, though we hope they will at least acknowledge that the AML BitCoin fills a desperately needed niche in the digital currency world, and that we are likely to emerge as one of the strongest players in the field. As for the legitimacy of our project, as you know, we have filed worldwide patents on our AML/KYC digital identity features, and have some of the world’s most powerful and impressive legal firms leading our efforts. The proof of our project will be its acceptance by governments and industry. We believe that our supporters will soon have much to celebrate in that regard. Would you consider doing a roadmap, and give updates? I am delighted to provide updates and hope to do so through this forum. What are you most excited about regarding this project? Five years ago, our team had a vision of the digital currency arena that is coming to fruition today. We were a lone voice, warning that governments would not continue to sit by idly watching non-compliant cryptocurrency scale in their financing systems – so we commenced the process of creating AML BitCoin. Our first efforts – Aten Coin – had all the right theories, but our inability to find security companies able to establish the AML/KYC protocols led us to solve the problem by creating the world’s first patented biometric digital identity system based on blockchain technology, and this is the foundation of AML BitCoin. At the very moment that dozens of major nations are calling for compliance with AML/KYC standards, we are emerging as the solution that keeps the digital currency revolution moving forward. That is what excites me the most! What has caused the delay in the public listing and when will the tokens finally hit the exchanges? We are hoping that the tokens will hit other exchanges within the next 30 days, but it is completely in the control of the exchanges. We are working assiduously with them to get there. What is the status on your pending patents? I will release some very big announcements on the patents very soon. All token holders will have a big smile! When might we start trading on HitBTC? We anticipate commencing on a few other exchanges first, as the HitBTC tech team is still engaged in integration of our non-ERC20 based. What are the reasons for no previous communication? We have been so laser focused on moving the project to the exchanges, that our bandwidth was exhausted. We have since been able to expand the team, and hope to make up for our lack of communication with a number of efforts like this AMA. We hope our token holders will continue to suggest ways we can improve our communications. Wow! This is great. Hey Marcus, thanks for agreeing to do this. What is the official update as to the status of AML BitCoin and the listing status on HitBTC? Thanks for your message! As stated, we are still waiting for HitBTC. So the question is do we get the attorneys involved which will upset HitBTC, or do we just calmly wait for them? Yes, we shall wait for them for now. They have legitimate reasons for the delay. So I'm sure the biggest question is, when can we expect the coins to hit an exchange? And is there any exchange other than HitBTC that will be trading them? Yes, we are currently listed on IDAX and we anticipate a few other exchanges within the next 30 days. When will the coin go from AML Token to AML BitCoin? Our tech team anticipates conversion from token to coin in no more than six months. We are hoping that the digital identity network is worldwide by then. Is there anything specific that you'd like Token Holders to know? The team at AML BitCoin is dedicated to ensuring the greatest possible success for our project, and we remain eternally grateful for your faith and support. I look forward to sharing some amazing news with everyone in the very near future. Stay with us, as we are all changing the world of digital currency for the better. Thank you all for your support.